Ascending Butterfly: Wordless Wednesday - Butterflies and Wine! Isn't it awesome when you can combine two things you love in one place? Actually 3 things! If you recall my post from October 6th (refresh your memory HERE) I let you guys know about two cool events in NYC one beauty themed, the other wine themed. 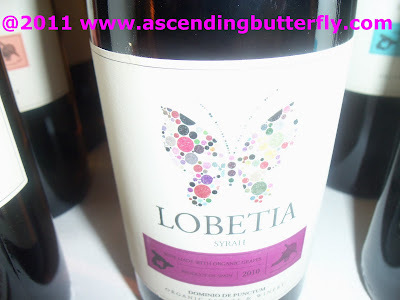 I attended Great Match 2011 - A Spanish Wine Tasting Event and lo and behold I had a butterfly sighting! Don't you just LOVE this label? (I know I do!) The Lobetia Syrah is made with ORGANIC grapes! Interested in learning more about Lobetia? Visit Terroir Wine Cellars, and you can also connect with them on Facebook and Twitter! FTC Disclosure Info: This is NOT a sponsored post. I attended the Spanish Wine Tasting as a member of the digital press. No compensation has been received. I really do love wine, butterflies and an organic lifestyle!